Requirements for water treatment within process industries vary from steam for heating, cooking or perhaps even sterilisation or humidification, through to heating or chilled water systems for heating or cooling process chemical plants. High purity water supplies for steam production, manufacturing, cooling and cleaning baths and sprays, are also a key area of our expertise. Whatever your requirement, we design bespoke water treatment and management systems to keep your costs to a minimum, improve productivity and manage risk. 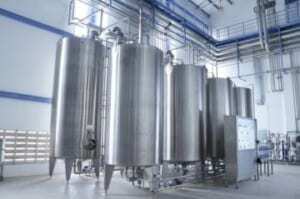 We consult on and manage water based systems in an extremely wide and varied range of environments notably metal finishing, packaged food production, aeronautics, brewing, R and D, personal care, construction, whisky production, flavourings manufacture, dairies, bacon processing, pharmaceutical manufacture, and manufacture of ocular lenses. These are all industries where stringent hygiene and quality standards are in place and our market leading technical knowledge and systems experience are welcomed. As qualified chemists and engineers, with extensive production systems experience, we are often very well placed to implement treatment and control systems which actually cover the whole process, from site incoming water to final product manufacture and grey water re-use. A total water design, operation and management package from Deep Water Blue Limited. To optimise your plant and ensure that your systems continue to operate efficiently and cost effectively, we implement a range of liquid water treatment chemicals, solid water treatment chemicals and pre-treatment solutions in order to manage pH levels, reduce contamination, remove sludge, and inhibit scale, electrochemical corrosion and microbiologically induced corrosion (MIC). We offer water treatment control and consultancy programmes, to any industry standard or in accordance with normally recognised standards, such as HSG274/BG04/BS8552 (sampling and monitoring of water from building services closed systems - code of practice) and also BG50 and BG29. Originally developed for use with steam systems the vSteam® system now extends to any type of water treatment system, including process water systems. It can further be adapted to meet the requirements of any water based system requiring data capture, collation and interpretation. This is innovative, unique and easy-to-use training system, also acts as an interactive two-way control panel and log-book. Call us to discuss your requirement for water treatment and process control, please call us 0870 460 2980.